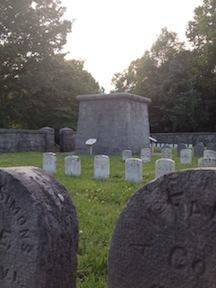 The Hazen Monument at Stones River is the oldest still-standing Civil War monument. The last battlefields we visit on our six-day marathon are our own. The nine-hour trek from Franklin to home has been stretched out by a brief stop at Stones River, then downpours outside of Knoxville, then fog outside Blacksburg. We’ve made our way across the Virginia piedmont and are finally approaching home. Twilight is graying the morning sky as we cross Mine Run and pass through the Locust Grove intersection. We’re on the edge of the Wilderness, plunging our way in. Coming up over the rise where Hill-Ewell drive bears to the right through the battlefield, we descend into Saunders Field even as fog lifts up out of the tall grass. Dan and I both gasp at the sight. It is though a shroud lay across the landscape while, at the same time, the spirits of the men who died there have risen in dissipated form to greet another morning. In a flash, we are through, back into the treeline on the east side of the field. Dan and I look at each other. “That was a-mazing,” I say. I’m hopped up on pineapple-flavored Mountain Dew Kickstart and coffee. Dan has been pounding Coca-Cola and coffee. We’re tried and completely wired at the same time. I look forward to getting enough sleep to at least hit my reset button. Then I can start to process this marathon. I have hit my last two Civil War “bucket list” sites (Andersonville and Vicksburg); I have walked in the footsteps of my great-great-great grandfather; I have seen larger-than-life icons, all sorts of myth-making, and some fantastic landscapes; and I have stretched beyond the Civil War to better understand the South. I have fallen in love with Shiloh all over again and I have been deeply moved by Andersonville and the experience of POWs. I have had my curiosity further piqued about the battles around Atlanta, and I have become fascinated with Franklin. The work of preservationists there impressed me…which grew to awe…which grew to inspiration. I have not had as much time to really roll up my sleeves with the history of some of these places. The accounts I’ve offered have necessarily been broad, passing brushstrokes—a result, partially, of my inability to dive in and, partially, the fact that I was doing so much writing on the fly. In the midst of driving, taking pictures, and seeing the sites, I managed to write 11,017 words (not counting these ones). I generally wrote in the evenings, sometimes in the mornings, occasionally in the car as Dan or Steph drove, and once in a McDonald’s parking lot as I piggybacked on their internet. Between Dan, Steph, and I, we have more than 3,000 pictures for the upcoming ECWS books—and that’s not including a pair of Atlanta-related books now in the works since our meeting with the fantastic Steve Davis. Greg Mertz and Shiloh…Lee White and Franklin…Matt Atkinson and Vicksburg. What a fantastic line-up! Plus, I managed to snag the last photos I need to finish up Meg Thompson’s Aftermath of Battle. That’s a lot of good of stuff. But best of all, I managed to find a little something different at each place: history, landscape, memory, preservation, culture, art, and all sorts of connections from the war that have echoed through the subsequent century and a half. I appreciate all the folks who went with us on this journey. It has been so nice to have the company. I hope all y’all have the chance to get out this summer to do some exploring of your own. May you get out to a battlefield you love and get out to a place you’ve never been—and may you fall in love all over again and fall in love with something new. I wish you safe travels. May you find much that nourishes your spirit. This entry was posted in Books & Authors, Emerging Civil War Series and tagged Civil War Trip 2015, Emerging Civil War Series. Bookmark the permalink. Enjoyed reading about your travels and experiences! It sounds like a fabulous trip. I liked the writing style and it definitely gave me some ideas, in case I decide to do any travel blogging in the future. Thanks, Sarah. Glad to have you along. I hope we’ll see another guest post from you here at ECW in the near future! Enjoyed every post. When ECW breaks into the tour business, let me know. I’m coming along next time! !